Lavish photography and groundbreaking texts unlock the magic of the island cultures of Indonesia, Malaysia, and East Timor through examples of textiles, sculpture, and metalwork from this prestigious collection. Lavish photography and groundbreaking texts unlock the magic of the island cultures of Indonesia, Malaysia, and East Timor through examples of textiles, sculpture, and metalwork from this prestigious collection. Eyes of the Ancestors takes an in-depth look at the Dallas Museum of Art's world-renowned collection of artworks from Island Southeast Asia. Beautiful photography and essays by distinguished international scholars unlock the magic of the island cultures of this region. Leading cultural anthropologist Reimar Schefold introduces these texts, which investigate various indigenous art forms from a fresh, art history perspective. They describe the contexts, purposes, and aesthetic influences of a range of objects, from intricately woven sacred and ceremonial textiles to carved ancestral figures. Also featured are gold and metalwork designs as well as weaponry and jewelry-most dating back more than a hundred years. A 19th-century mouth mask in the collection, from the Leti Islands, is one of only our known to be in existence. Carved in the shape of a bird's head, this wooden mask was used in ritual dances. 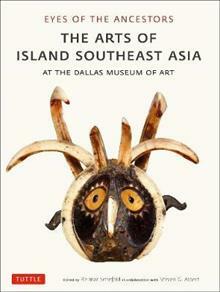 Other spectacular examples from the collection also reflect the beliefs and practices of these island cultures.